It's the season for refreshing your wardrobe! Branch out to 7PM Boutique, Beadmask, Thyme2dream, Theresa Rose Designs, Athenianaire, and Life is the Bubbles for leaf jewelry and spring accessories. 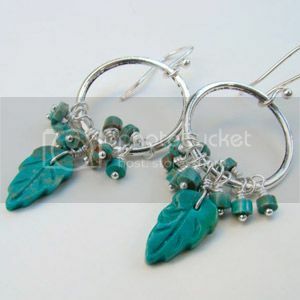 7PM Boutique's turquoise leaf earrings feature beautifully hand-carved leaves and heishi beads on silver hoops. Many cultures view turquoise as a sacred stone. It's been found set into the earliest known protective amulets. The Aztecs even believed it to be a stone of the Gods, so mortals weren't allowed to wear it. 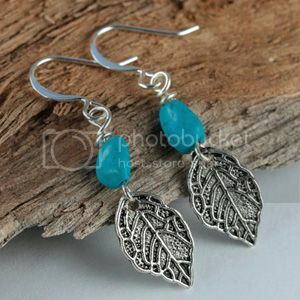 But don't let that discourage you from buying it - if anything, these turquoise earrings will make you feel like a goddess! 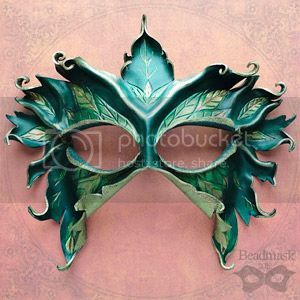 Beadmask's Lady of the Leaves mask may blend into an enchanted forest but will make you stand out at a Renaissance faire. The design is hand cut and sculpted from fine tooling leather, then hand carved and painted in shades of rich forest green, iridescent emerald and olive with just a hint of bronze. The leather mask measures approximately 12" wide by 10" high at the highest and widest points, and ties with quality stretch ribbon straps. 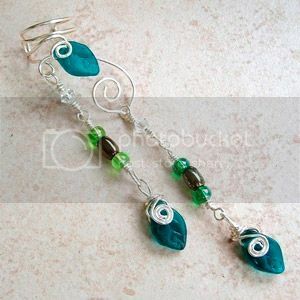 Thyme2dream's leaf ear cuff dangles deep emerald green leaves and beads from non tarnish silver wire. The wire is nickel free and has a protective coat that makes it easy to wear even for allergy sufferers. Designed to fit any ear, her ear cuffs are adjustable and can be worn with or without regular earrings - no piercing needed! That way you don't have to cast a complicated spell to wear it comfortably - it'll bring its own magic to a fairy costume or everyday outfit. Theresa Rose Designs' silver leaf earrings are lightweight and delicately pretty like a spring day. The earrings measure 1.5" from top to bottom. The detailed antique silver leaf charms are embellished with vibrant blue chalk turquoise pebble stones, hung from silver-plated ear wires. The pop of color is sure to brighten up any outfit, especially on those lazy mornings when you barely have the motivation to pick out a black shirt and comfy jeans to wear. Athenianaire's butterfly keychain is a brilliant way to decorate a backpack or keyring set. The Sunset Moth of Madagascar wing, set safely into a glass cab, offers an amazing array of reflective blue greens that will stand out in the clutter if you lose your keys! 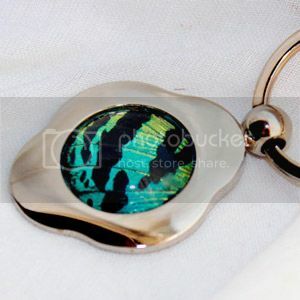 The key chain is rhodium silver coated that produces a nice sheen. 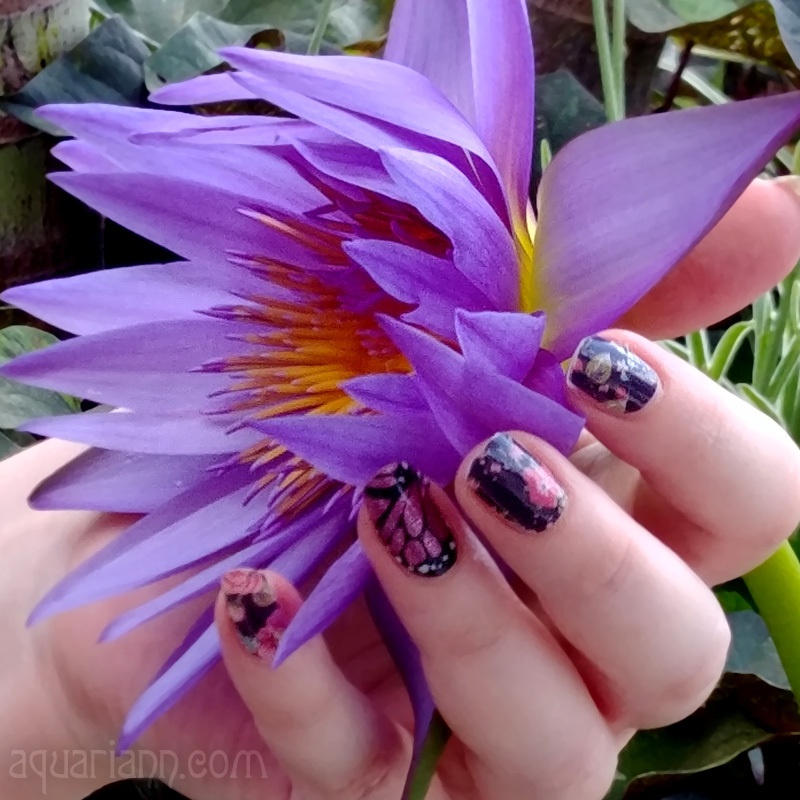 Plus, 100% of this sale goes to the Moth and Butterfly Rearing Project so you can buy something pretty and catch good karma at the same time! Life is the Bubbles' magic bottle necklace is inspired by Disney’s Jungle Book movie. Forget about your worries and your strife when wearing this carefree piece of jewelry. The chain is 19.5" long and closes with a rope toggle clasp. 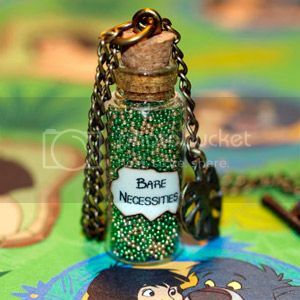 The sealed bottle is filled with shiny beads and embellished with a palm leaf charm to remind us that it is Old Mother Nature's recipes that brings the bare necessities of life! Now shake your tail like Baloo and enjoy the beauty of spring! That mask is definitely awesome! Love it. 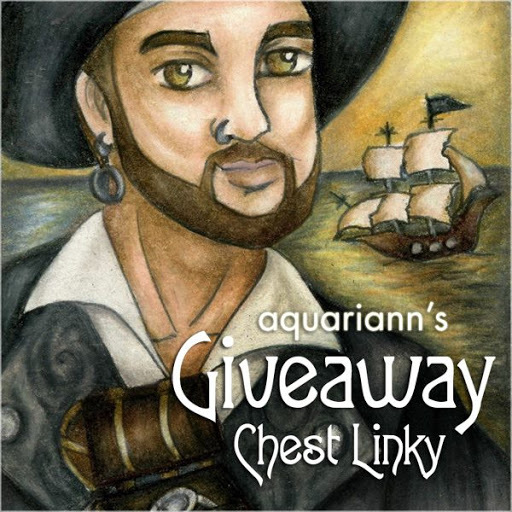 I look forward to seeing all the art/artists you feature. Your quirky taste suits me fine. awesome mask and turquoise leaf earrings!Love them! !